Ask most six-year-old kids what they want to be when they grow up, and they probably wouldn't say sound engineer. Aaron Padilla, senior audio director for the five-campus Bayside congregation, was not like most six-year-old kids, however. At that young age, he knew that's what he wanted to do, and lo and behold, he did it. After a few years on the road handling monitor and production responsibilities for Christian touring artists like BarlowGirl, Rebecca St. James, and Jesus Culture, Aaron found himself in Granite Bay, California, signing on as Audio Director at Bayside Church. Far from hanging up his travelin' shoes, he was about to embark on a gig that required him to 1) make sure that that 14,000 worshippers in five different churches got the message every Sunday, and 2) still find the energy to go on tour with Bayside's Stratocaster-rocking, Dove Award-nominated Worship Pastor Lincoln Brewster. When I checked in at Bayside recently, I knew that Aaron was setting up an audio system at the church's newest location and getting ready to head out on Lincoln's East Coast Oxygen Tour, so I asked Bayside member (and community relations volunteer) Mark Miller for the Bayside backstory and an update. Here's what he told me: In 1995, Ray Johnston (still Senior Pastor today) conceived Bayside along with a small group of concerned parents as "a church for people who don't like going to church" to fill a spiritual void following the tragic suicides of two local teenagers. The first meeting was in a member's living room. That was quickly followed by Sunday services in a tennis club, an elementary school, a high school, and in 2004, the 94,500 square-foot Granite Bay complex that is Bayside's main campus. Bayside's outwardly directed, community-focused Christian church-for-everyone was onto something. Today, Bayside is on the cusp of launching its fifth campus in the greater Sacramento area. There are hundreds of small groups and ministries, dozens of church-sponsored, teen-powered humanitarian efforts and yes, an A / V rig at the main campus that rivals concert venues. "We're always trying to push the envelope a little," Mark told me, "because we believe that contemporary music is one way to get to the heart of God. It's an integral part of the whole experience at Bayside." 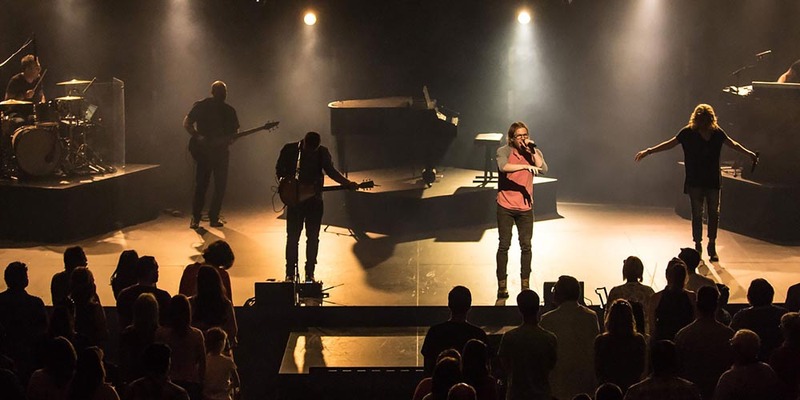 Beyond divine intervention and the power of prayer, we wanted to know how Aaron and Executive Pastor of Worship Technology Lee Fields are able to pull off 11 services a week, six of them in "portable churches" with a mostly volunteer audio staff. Bayside attracts more worshippers for its weekly services than most mid-sized concert venues, yet you and Audio Assistant George Krapivko are the only full-time audio engineers. So, let's talk about the numbers. You obviously need an army of volunteers. That's right. There are around 100 people on our tech crew, but that includes video and lighting as well as audio. Right now, the audio crew that serves all five campuses totals 30. Does each location have a dedicated audio crew? Each site does, but we rotate staff across all five. Granite Bay is our main campus, so the setup at that location is the most sophisticated. We do major events, and the live video feeds from there. This Easter, Bayside celebrates its 20th anniversary. Will your Easter service be different than a typical Sunday morning service? A typical service at all of our sites runs about an hour and 20 minutes. It includes video, either a live or live-streamed message from our Senior Pastor Ray Johnston or Teaching Pastor Curt Harlow, and, of course, live music since each church has its own praise band.The production values are very high since the worship part of the service is concert-inspired. We're opening a new campus at Blue Oaks this Easter, so to keep things a little simpler, we're not going to do a huge production value Easter service this year. You mention Blue Oaks. That's one of four portable Bayside congregations. What accommodations have you made to get that crew up to speed for a first-time event like this? The temporary location for that campus is a local college, so we'll be doing a preview service there. We have a brand-new full touring mobile set-up that's as much of a replica as our Granite Bay system as possible. When our volunteers go back and forth between churches, they're dealing with the same stage set-up, the same audio gear. It all looks the same. It all works the same way, which makes it a lot easier for volunteers moving back and forth. How is the setup different from main campus to satellite location? It's primarily a matter of scale. What's the training process like for volunteers? Obviously, they have a range of experience. Having some experience is great because it gives them a basic starting point. If they don't have experience, then I'm not going to put them on a console right away. We have other jobs in the technical department where I can start them off. I may start someone as a stage manager to give them a sense of how the stage works. We'll show them how to do a proper mic check, how to make sure the batteries are fresh, or how to handle stage setups and stage transitions. I slowly build them up to A2 or an M2 where they're shadowing a front of house or monitor guy. It helps them to watch how the FOH guy is mixing, how the monitor engineers get the vibe from the band, or generally, and how we want it to sound for the congregation. We'll have them do that for a period of time. When they feel like they're ready to start mixing, I'll have them start mixing in other ministries during the week that have full bands so they can start honing their mixing skills. You obviously can't be in five places at once. What rules of the road can you apply from your secular past to make things go smoothly for your audio volunteers? I learned a bunch of stuff about setup from touring days that makes it easier for them. First of all, I design all of our portable systems so that they're all volunteer-friendly. The Blue Oaks system is five racks that line up right next to each other. There is one cable each: daisy-chained and color-coded. I designed the system to be completely set up in about 30 minutes. The crew can just grab the cable and lock it into place. That's a full concert touring system. We do recall on all of our mixing consoles. It's a starting default for us and for all of our volunteers. We create a show file on the console that is pretty much dialed in, so all the audio crews have to do is set the gain to a predetermined level and turn the fader to zero. Everything should be pretty dang close to mixing. That way they don't have to start every week from scratch and re-fade this grand and glorious thing we're expecting. Ninety-eight percent of the work is done for them on the console. What's the most typical problem you encounter? Sometimes the patching is wrong. Maybe the snake is upside down and they'll patch the wrong input. Sometimes the amp will be on the wrong setting. They're almost always connectivity issues that are easy to troubleshoot and resolve. How about frequency coordination and interference? We've had trouble finding open frequencies during the week but not on weekends. A couple of years ago, we did a big Christmas service at our Granite Bay campus and had something like 60 channels of wireless. Our drum kit was all wireless, the drum line was wireless, the guitars, all the vocals, of course, and everyone was on PSM® systems. 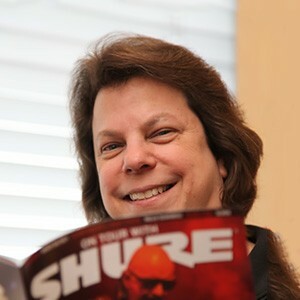 We used the Shure Wireless Workbench® software, and it was really helpful. We didn't have any problems at all during the show. It's hard not to notice that all of your mics and all of your personal monitor systems are Shure. Any advice for the six-year-old out there who may have the same career aspirations that you did? For all you six-year-olds and beyond out there, never give up on your dream! Try to find great audio engineers out there, and lock onto them like a leech! Watch every award show and concert you can, and look how they mic all the different types of gear and do their stage transitions. Listen to as many different types of music that you can, and start memorizing instrument sounds that you like, then try to re-create those sounds the next time you are able to mix something. Also to be a great audio engineer, I think you should know what every instrument on stage sounds like naturally before you even mic it up. This will give you a good understanding on what good tone sounds like. I guess my final piece of advice would be never be afraid of a little hard work, and never stop learning! Remember, this isn't going to happen overnight. It's going to take a lot of practicing and hard work to hone your skills. Get in there, and make it happen.